Amritsar, the holy city in Punjab is a place that almost immediately reminds us of the mesmerising Golden Temple. This shrine is the holiest place of pilgrimage for Sikhs from all over the world. How lucky are the folks of Delhi that this stunning city is located just 8 hours from the city?! This boisterous city is known for its outstanding cuisine, handicrafts and fabric production. Apart from the Golden Temple, the city is spread with many other places to visit, some religious and some historical, that will surely pique your interest. Read all about these places, along with stops you can make on the way to Amritsar. Since the weather during summer and winter are both quite extreme, the ideal time to visit Amritsar is between the months of September to December or February to March. These months have a relatively pleasant climate that will allow you to go for sightseeing hassle-free. By Air: Amritsar's Sri Guru Das Jee International Airportis well-connected to many cities like Delhi, Mumbai, Kolkata as well as international places. By Train: Numerous trains from Delhi connect to the Amritsar Railway Station on a regular basis. The station is well-connected with many other major cities like Ahmedabad, Agra, etc. By Road: State government run buses, as well as private buses, are available in plenty to and fro places like Delhi, Shimla, Dehradun etc. The distance between Delhi to Amritsar is 450 km if you travel through this route, and it takes 8-9 hours to be completed. If you've read or heard stories about the Hindu epic Mahabharata, then you know the significance of these cities of Haryana. Panipat is believed to be founded by the Pandavas while Kurukshetra is the city where the great war took place. Panipat and Kurukshetra are located 86 km and 155 km from Delhi respectively. Some places you need to visit at this historic cities are Brahma Sarovar, Panipat museum, Kala Amb Memorial, Sthaneshwar Mahadev Temple, to name a few. Located at a distance of 142 km from Amritsar, Ludhiana is a city that is settled on the old bank of river Sutlej. This city is beautifully spread with many historically significant places that give it an old world charm. Lodhi Fort, Nehru Rose Garden, Rara Sahib Gurudwara, Pir-I-Dastgir Shrine, Rural Museum are some of the places you must visit at Ludhiana. Previously known as Jullundur during the British Raj, Jalandhar used to be the capital city of Punjab before independence. It is located 82 km from Amritsar and is the last stop before reaching the city. Places of interest at Jalandhar are Imam Nasir Masjid, which is an 800 year old mausoleum, Devi Talab Mandir, Pushpa Gujra Science City, to name a few. 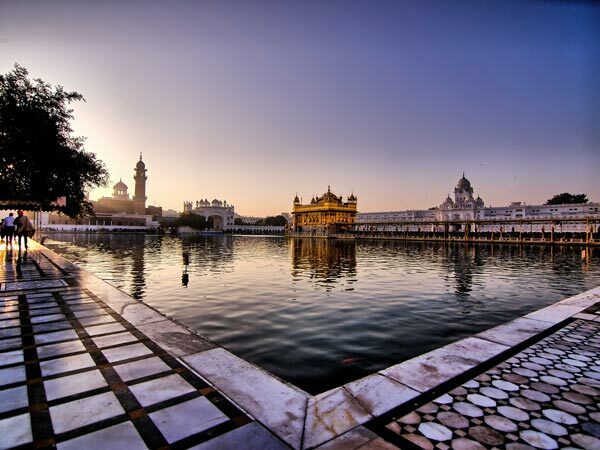 Read on to know about the places to visit in Amritsar. Sri Harmandir Sahib or Darbar Sahib, the two other names of what the world recognises as the Golden Temple is the highlight of Amritsar. The temple gets its name due to its extravagant dome that is covered with 100 kgs of pure gold. It is built by a holy sarovar, a man-made lake. This lake is believed to purify devotees of all their sins. The temple remains open right from 3 am to 10 pm. Jallianwala Bagh is a memorial that holds utmost national and historical importance since it commemorates those who passed away in the terrifying massacre that took place in 1919. It is located just about 1.5 km from the Golden Temple. Jallianwala Bagh has the wall pinned with bullet marks till date, along with the plaques that mention the horrors of the massacre, and the well where hundreds of people jumped to their death. Gobindgarh Fort is a regal structure that was built by Gujjar Singh Bhangi in the 18th century. Initially, the fort was under the control of the Army but since 10th February 2017, the fort has been open to the public. Punjab's glorious history is being retold in the form of a 15-minutes 7D show that portrays the life of Maharaja Ranjit Singh in this fort. It is shown in the fort throughout the day. Wagah is a village in Pakistan and the Wagah Border is a road that separates India and Pakistan. It has gained significant tourist interest in the past years due to the Wagah Border ceremony that takes place here every evening. Two hours before the sun sets, a beating retreat ceremony happens at the border that is undertaken by the Indian Border Security Force along with the Pakistan Rangers. The place sees almost 5000 people everyday. With an architecture similar to that of the Golden Temple, Durgiana Temple is mainly dedicated to Goddess Durga. It is also known by the names Lakshmi Narayan Temple, Sitla Mandir and Durga Tirath. Goddess Lakshmi and Lord Vishnu are the other deities worshipped in this temple. The temple is built next to a sacred lake and has a dome, canopies and is lit with colourful lights. Go on a shopping spree at the Hall Bazaar, the market that is lined with streets of shops that have everything right from Amritsar's famous handicrafts to electronic goods. The entrance of the market has a Hall Gate, also known as Gandhi Gate, made in Mughal architectural style. Don't miss out on Phulkari embroidery work of clothes or dress materials that is popular in Amritsar. Pul Kanjri is a historical site established by Maharaja Ranjit Singh, that is located about 35 km from Amritsar. The village used to be the main trading site during his period. Pul Kanjri is a fortress that consists of a Gurudwara, a mosque, a temple and a bathing pool. You can witness stunning wall paintings, Pul Kanjri Sarovar, and other such intriguing aspects of the fortress. If you leave Amritsar without trying out their wide range of authentic Punjabi cuisine, you're at a loss! First, you must try the Langar Ka Prasad that is prepared in the Golden Temple, preferably early in the morning to avoid the crowd. Try out the Amritsari Kulcha, Chicken Tikka Tandoori, Lassi, Jalebi, in the endless lines of dhabas of Amritsar.